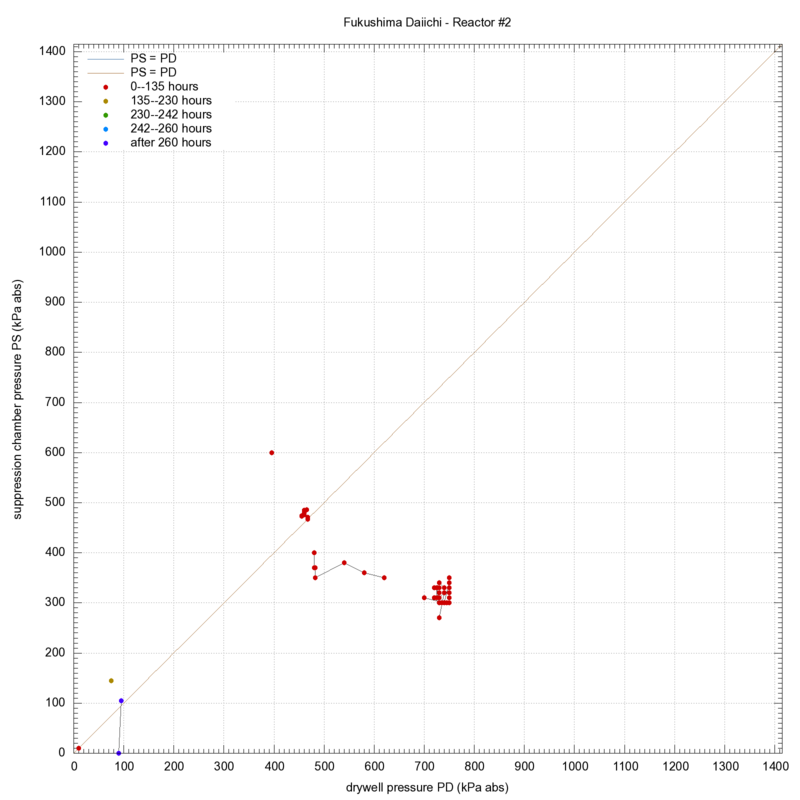 The following plots show the partial time evolution of physical quantities in the Fukushima Daiichi reactors #1, #2, and #3, after the march/2011 earthquake and tsunami. Note that the incident started on 2011-03-11 (friday). 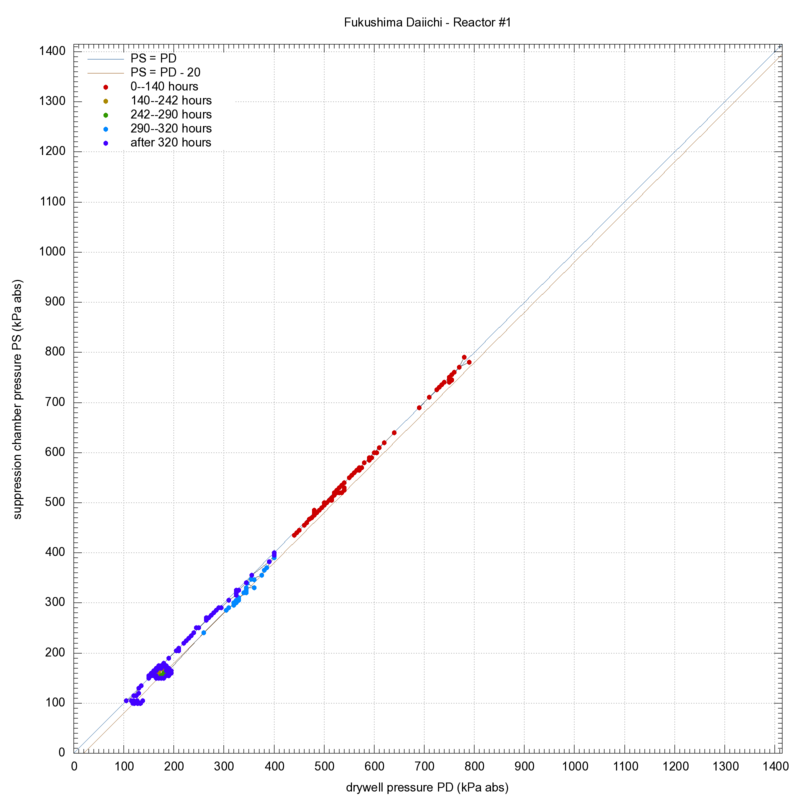 Note also that the vertical scale in the Time × Pressure plots is logarithmic. 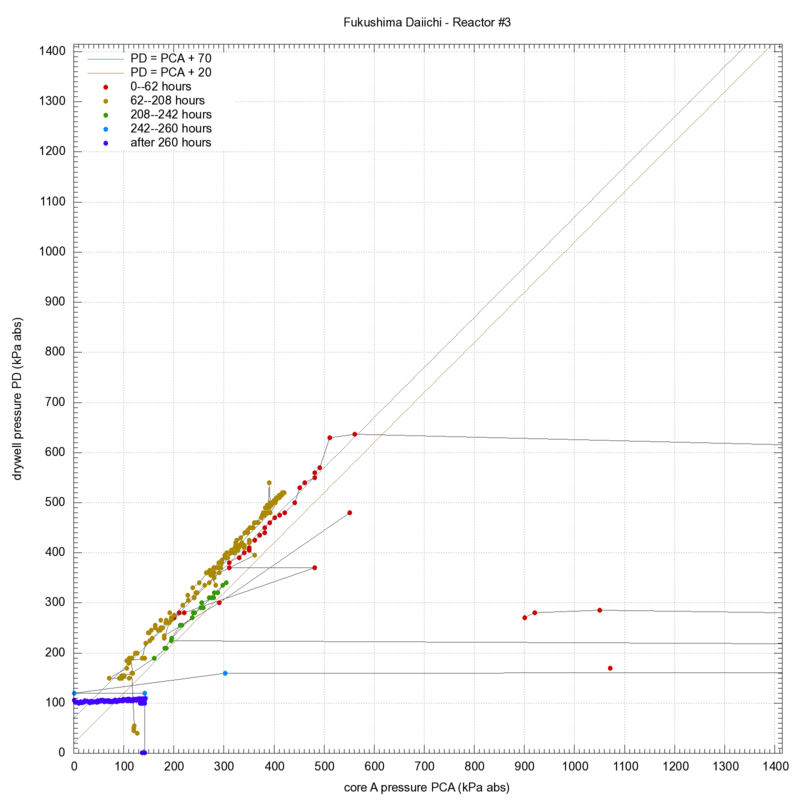 Another set of plots of the same data can be found in a wordpress site called FNPP1 reactor parameters maintained by user Daniel "dgr4quake". This quantity is the absolute pressure in the inner reactor pressure vessel ("RPV"), in kilopascals (kPa). Two readings are available, "A" and "B" (the latter sometimes labeled "C" for unit #2 and "D" for unit #3). Core pressures listed in the sources are usually gauge readings relative to atmospheric pressure ("MPa g"), so they were incremented by 101 kPa to match the other pressures (all absolute). Note that 101 kPa is approximately 1 bar (one atmosphere) i.e. the pressure inside the core is the same as that of air outside the building. This quantity is the absolute pressure (kPa) in the drywell ("D/W"), the outer pear-shaped steel container that surrounds the reactor. A value of 101 kPa means the same as outside air pressure. This quantity is the absolute pressure (kPa) in the surge suppression chamber ("S/C"), the torus (donut) shaped chamber below the drywell container. A value of 101 kPa means the same as outside air pressure. This quantity is the temperature (celsius) of the reactor's inner pressure vessel (RPV), taken somewhere near the water injection nozzles. 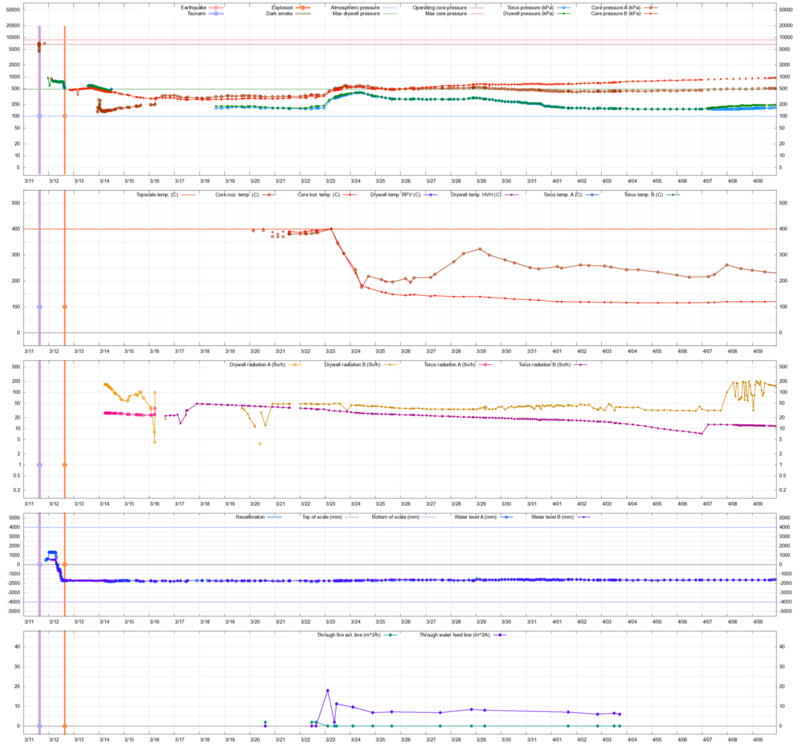 The upper limit of the sensor's range (400 C) was exceeded on some occasions. This quantity is the temperature (celsius) taken somewhere near the bottom of the reactor's inner pressure vessel (RPV). 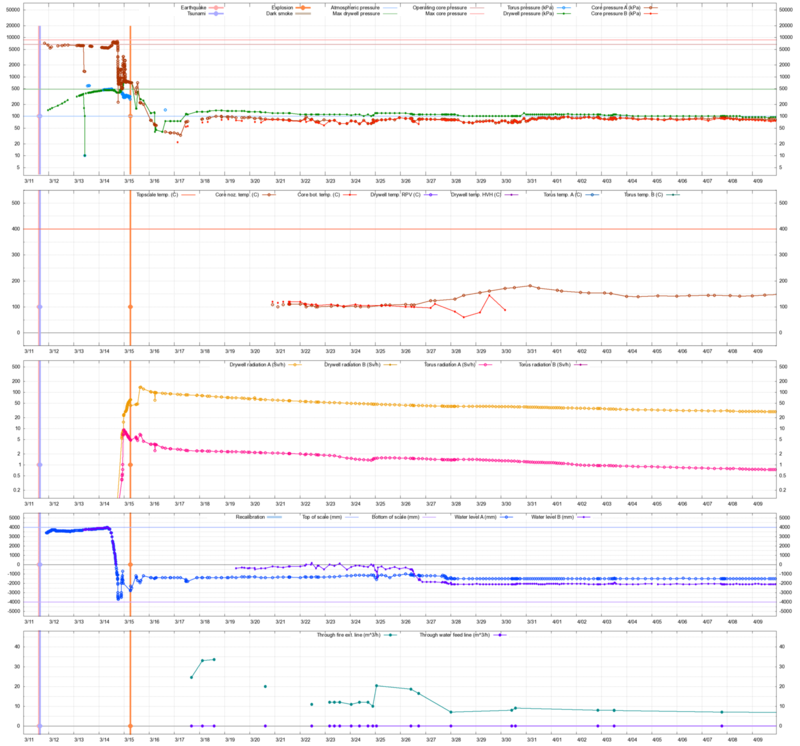 The upper limit of the sensor's range (400 C) was exceeded on some occasions. This quantity is the temperature (celsius) in/of the drywel. 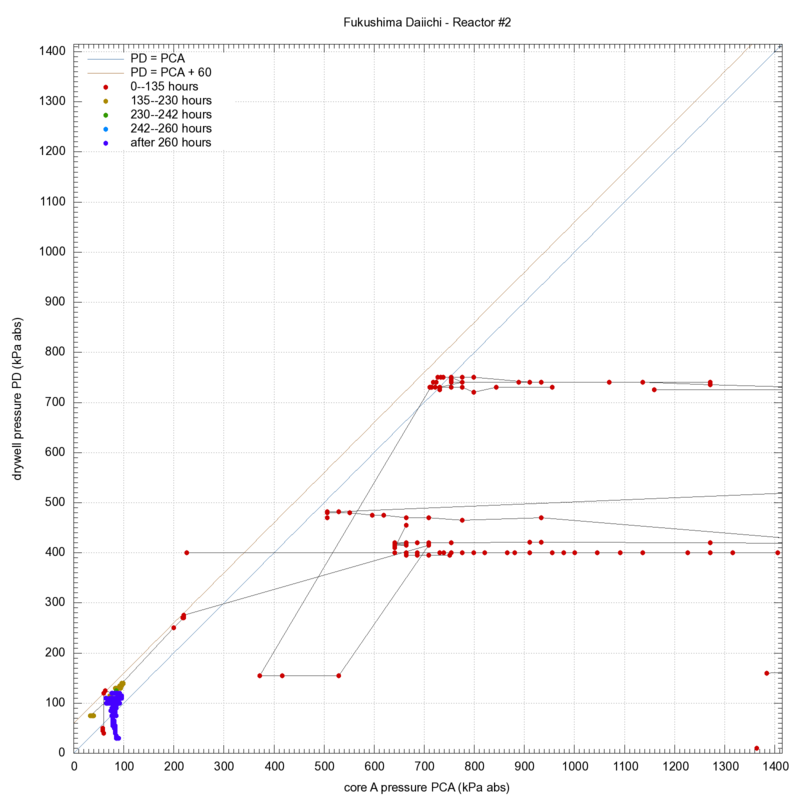 NISA began publishing this quantity on release 99 (18/apr 08:00), as two separate readings: "RPV" (taken near the bellows seal between the drywell's mouth and the top flange of the reactor's pressure vessel) and "HVH" (hydrogen venting head). This quantity is the temperature (celsius) in/of the surge suppression torus. NISA began publishing this quantity on release 98 (17/apr 14:00), as two separate readings "A" and "B". This quantity is the radiation level (sievert per hour) in the drywell, as measured by the CAMS instrument. Note:The plot scale is logarithmic. Since release 98 (17/apr 14:00) NISA started giving two CAMS readings, "A" and "B"; according to the SLP1--SLP3 sources the previous readings were sometimes "A", sometimes "B". This quantity is the radiation level (sievert per hour) in the surge suppresion torus, as measured by the CAMS instrument. Note:The plot scale is logarithmic. As for the drywell radiation, since release 98 (17/apr 14:00) NISA started giving two CAMS readings, "A" and "B". This quantity is the water level inside the (inner) reactor pressure vessel, in millimeters, measured from the top of the fuel elements. 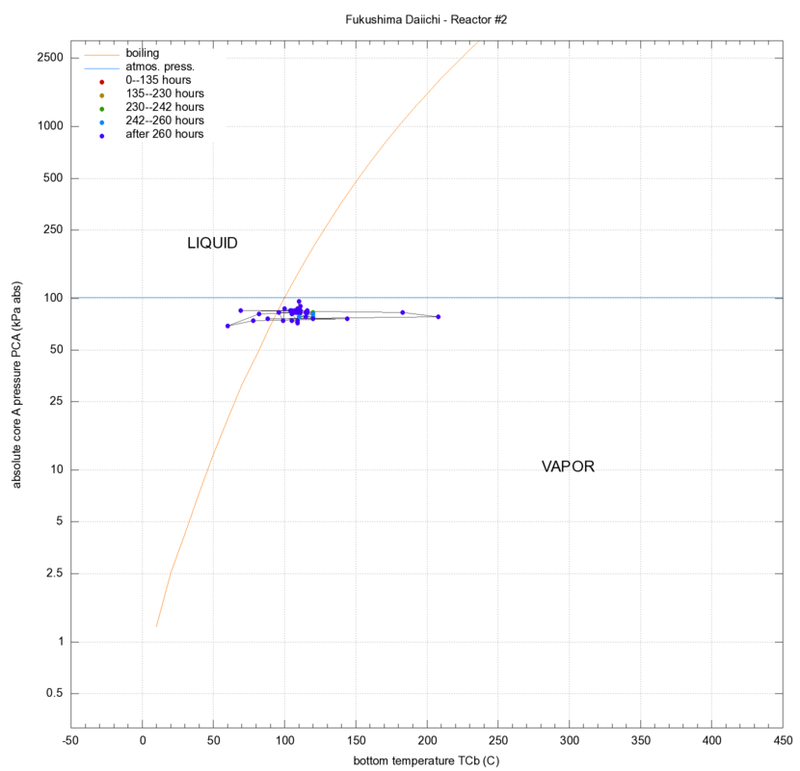 Negative values mean that the fuel is partly out of the water. There are two readings, "A" and "B". Note that in previous versions of this page only one reading was plotted. This quantity is the rate at which water was pumped into the (inner) reactor pressure vessel, in liters per minute. Some of it was saltwater, some freshwater; some was injected through the fire extinguisher lines, some through the water feed line. In the NISA press releases, this quantity is updated sparsely, only every few days. It is not clear what happens between readings; presumably the rate remains constant until a new reading is released. Most of the time NISA reported only one reading for this variable, shown in the plots as the "A" values. Starting in mid-may, a second number was published by NISA for reactor #3 (only), shown in the plots as the "B" values. Presumably this is related to them switcingh from the fire extinguisher line to the water feed line. 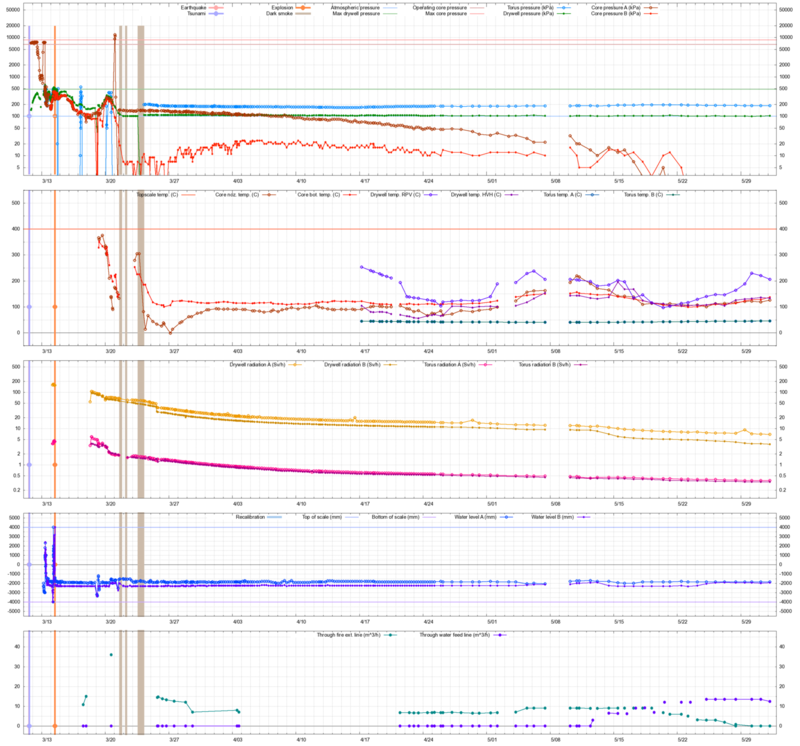 The orange diamonds and vertical lines indicate the time of the explosions in reactors #1 and #3, and the explosion-like sound heard from reactor #2. The vertical position of the dot is arbitrary. 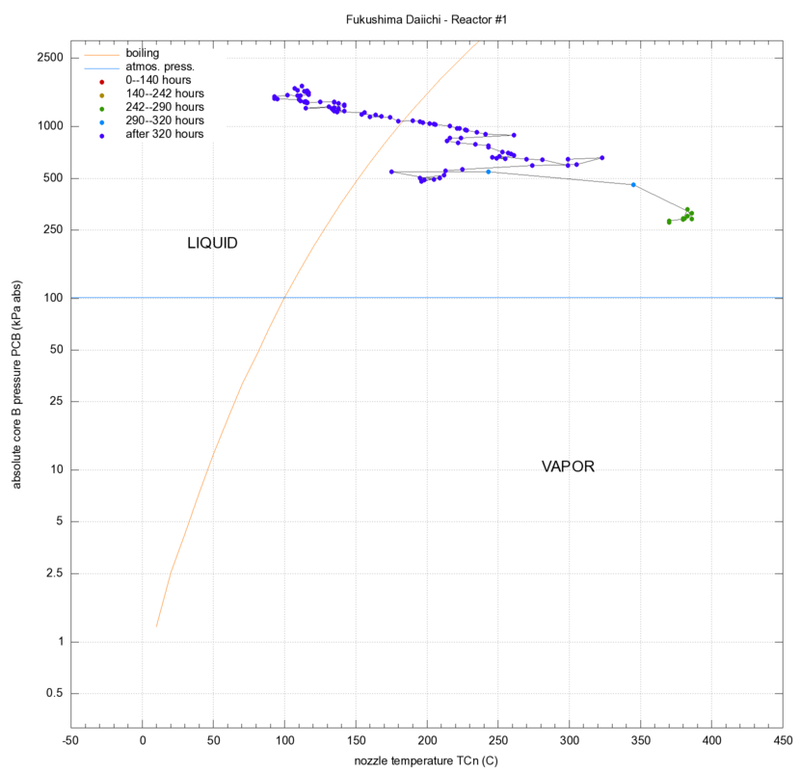 The light gray vertical lines show the approximate times when black, gray, or grayish smoke was observed coming from reactor #3. White "smoke" (steam) is not marked. 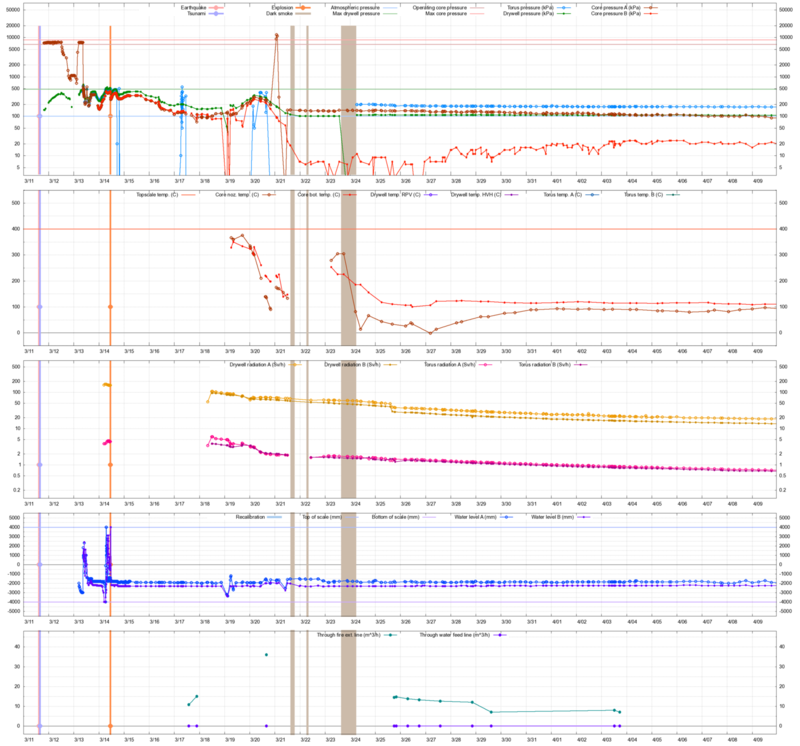 PF01: Some values of core pressure, drywell pressure, and water level of reactor #1 (only) between 2011-03-11 22:00 and 2011-03-12 15:28 were eyeballed from a graph found on a Physics Forum post by user "Fred". 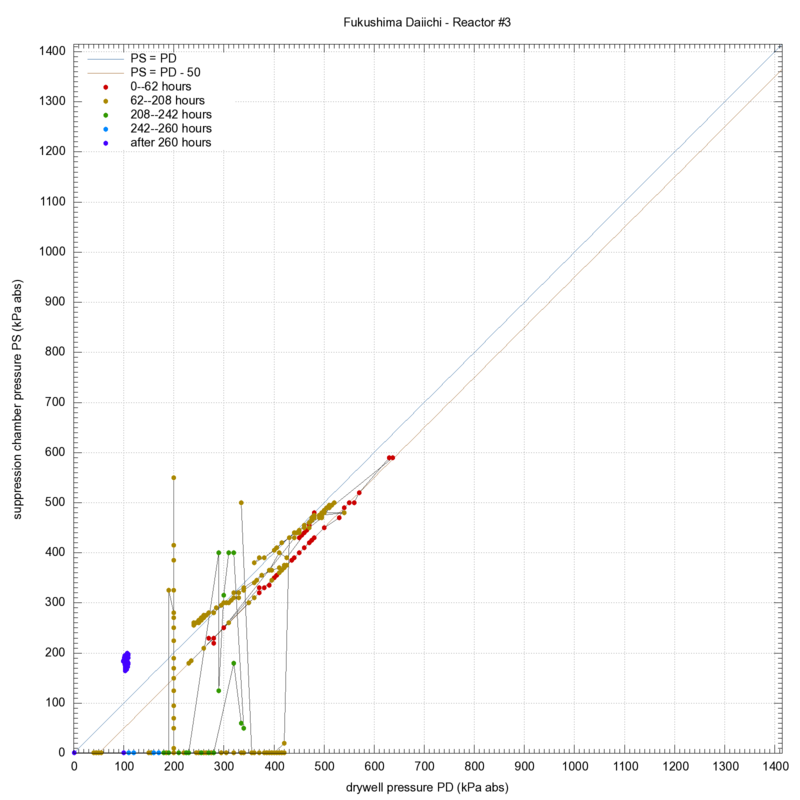 SLP1: Readings of pressures, water levels, and CAMS radiation for reactor #1 between 2011-03-11 19:30 and 2011-04-24 21:00 were taken from TEPCO document Parameters for water and pressure - Fukushima Daiichi Unit 1 (revised). SLP2: Readings of pressures, water level, and CAMS radiation for reactor #2 between 2011-03-11 20:07 and 2011-04-24 18:00 were taken from TEPCO document Parameters for water and pressure - Fukushima Daiichi Unit 2 (amended). 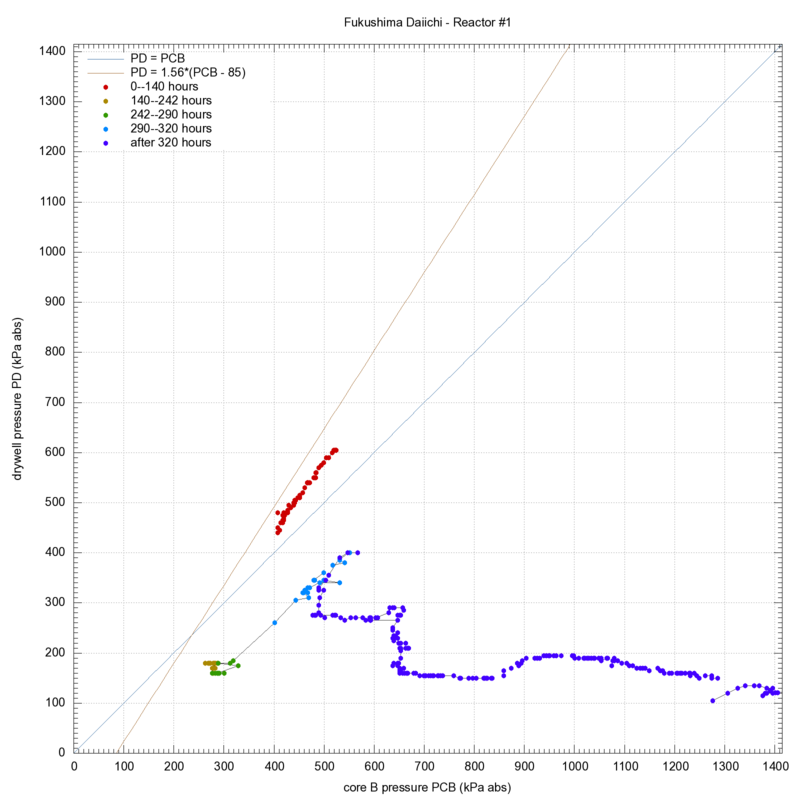 SLP3: Readings of pressures, water level, and CAMS radiation for reactor #3 between 2011-03-11 19:30 and 2011-04-24 18:00 were taken from TEPCO document Parameters for water and pressure - Fukushima Daiichi Unit 3 (amended). NIRS: A few data points between 2011-03-12 15:30 through 2011-03-17 were taken from a PDF document titled 'Condition of the plants of the unit 1-3 at FI site', fetched from the Nuclear Information and Resource Service (NIRS) site on 2011-03-22. That site attributes the data to the Citizens' Nuclear Information Center in Tokyo. Most of the data in this document was equal or very similar to the values given in the SLP1--SLP3 sources above. Since the latter seem more authoritative, they were followed whenever there was a disagreement. TTBL: The temperature readings from 2011-03-19 06:30 to 2011-03-22 15:30 were obtained from a scanned worksheet presumably prepared by TEPCO. N001-N999: Data from 2011-03-22 onwards (water level, injection rate, pressure, and temperature) come from the Nuclear and Industrial Safety Agency (NISA) News Releases, either the English version or the Japanese version. For further information please contact the document authors. 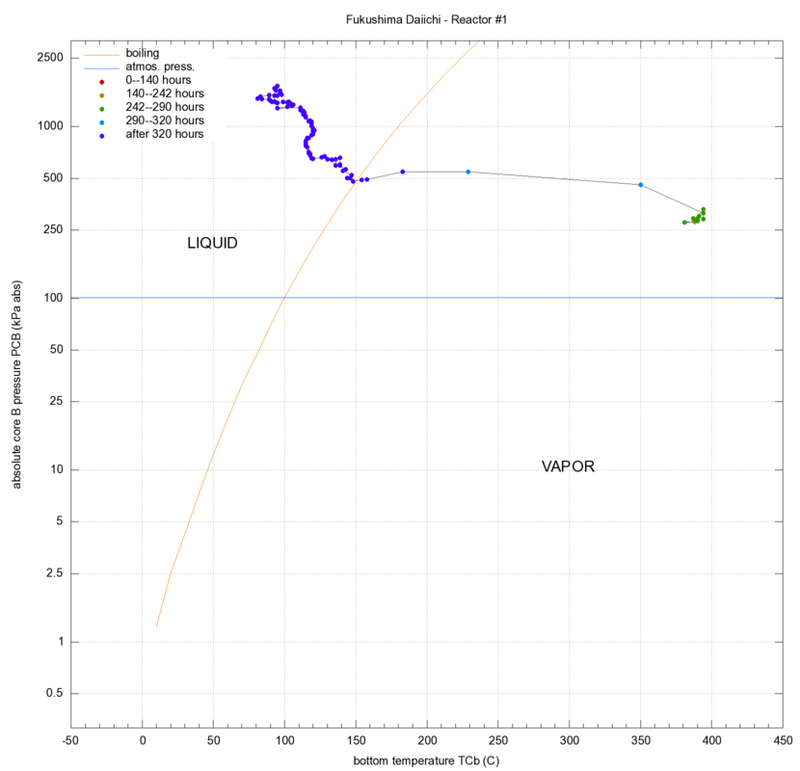 flow-un1-t.txt, flow-un2-t.txt, and flow-un3-t.txt: water injection rates (format changed on may/26). pres-un1-t.txt, pres-un2-t.txt, and pres-un3-t.txt: pressures (format changed on apr/18). wlev-un1-t.txt, wlev-un2-t.txt, and wlev-un3-t.txt: water levels (added apr/18). heat-un1-t.txt, heat-un2-t.txt, and heat-un3-t.txt: temperatures (format changed on apr/17,apr/18). cams-un1-t.txt, cams-un2-t.txt, and cams-un3-t.txt: radiation levels (format changed on apr/17,apr/18). boom-un1.txt, boom-un2.txt, and boom-un3.txt: explosions and other events (added apr/18). Values that were missing in the original documents are encoded as "99999" in these files. These values appear as gaps in the plots.Entries that were marked "down scale" or "over scale" were either entered as "99999" or as the assumed top and bottom of the instrument's scale. There are also a few additional datafiles with older data from NIRS or NISA, which either duplicate some of the data above or disagree with them. Some data were almost certainly typos and were corrected (hopefully) as listed in separate page. Several other outlier points in the plots are suspected data errors, but the suspicion was not enough to allow or justify a correction. 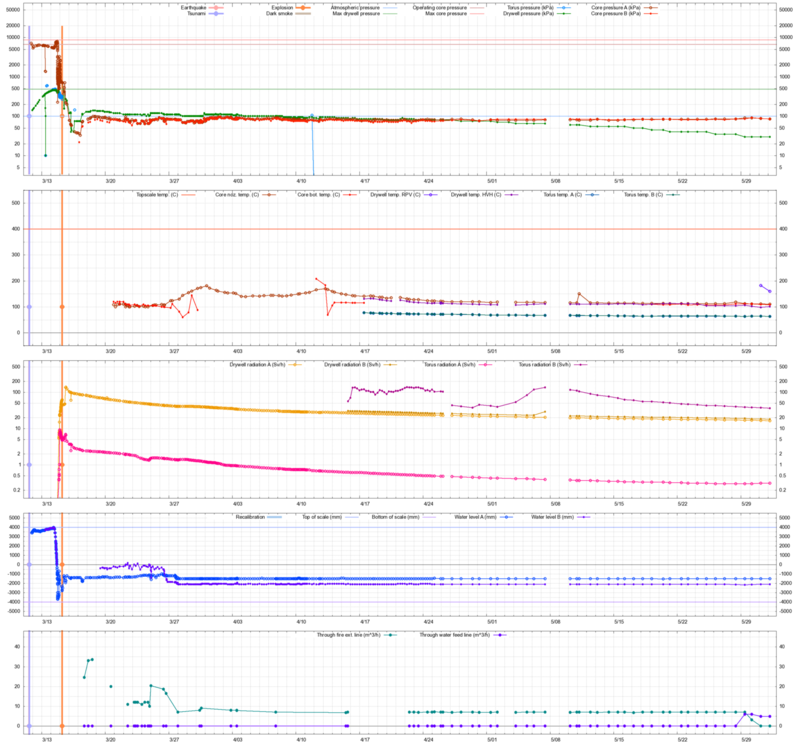 plot-reactor-pres.sh - pressure × time plots. plot-reactor-heat.sh - temperature × time plots. plot-reactor-cams.sh - CAMS × time plots. 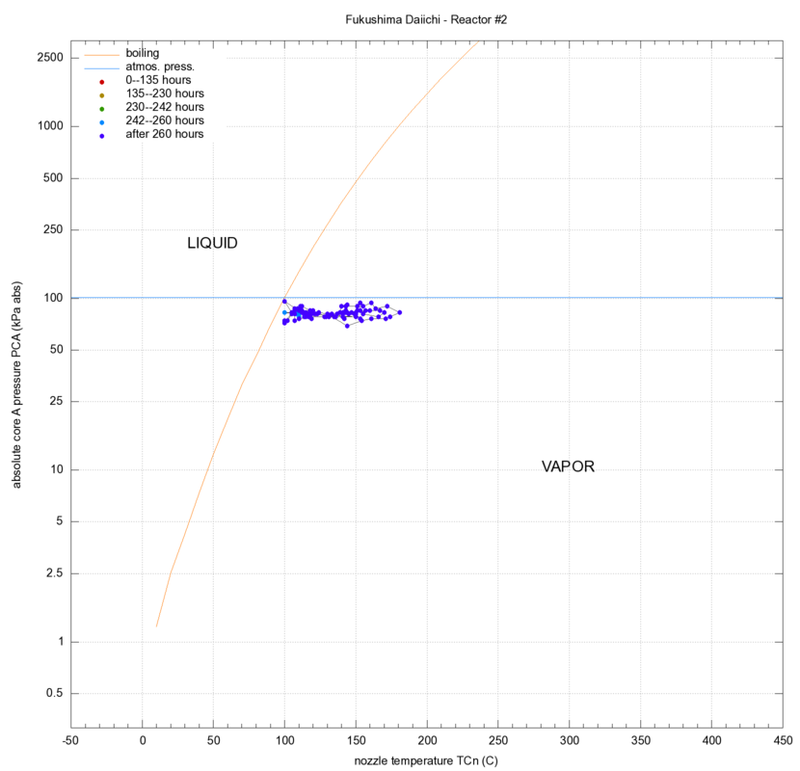 plot-reactor-wlev.sh - water level × time plots. plot-reactor-flow.sh - water inflow × time plots. 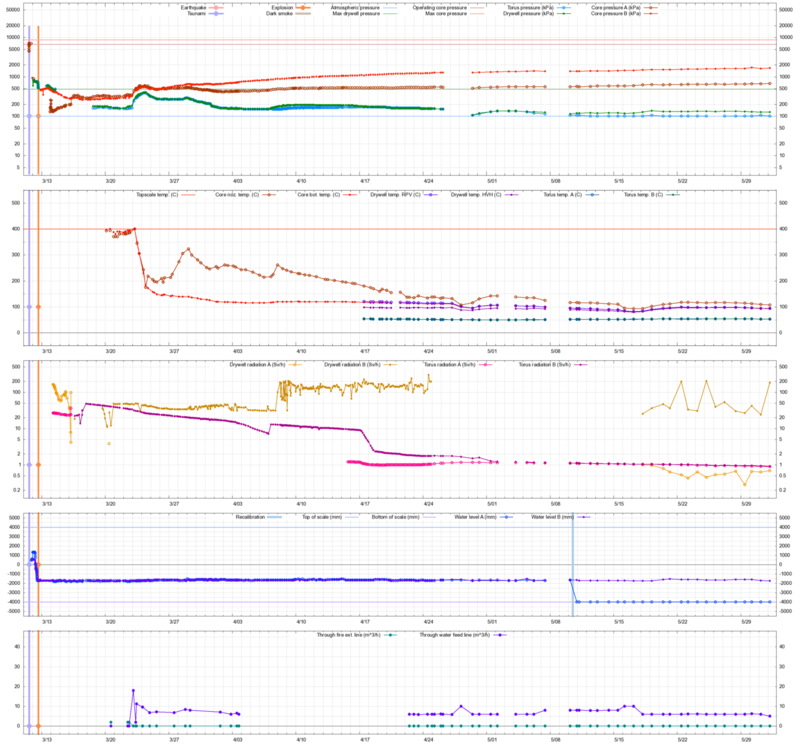 plot-pressure-tracking.sh - pressure × pressure plots. plot-pressure-temp.sh - pressure × temperature plots. recompute-times.sh - convert date+hour to elapsed hours. IMPORTANT: These plots, scripts, and data files are provided "as is", for the reader's convenience, with no guarantee whatsoever. There may be errors in the original documents and/or in my transcription and processing of their data. This page is NOT an official document of the State University of Campinas (UNICAMP). Neither its author (me) nor UNICAMP should be held responsible for any damages that may result from the use of this information. Corrections and suggestions are welcome.